Students will be introduced to one of the basic elements of art—color—through analysis of works of art by Monet, Matisse, and Kandinsky. Class discussion focused on these paintings will help students understand how artists use color to convey atmosphere and mood. They will then test their color expertise by completing a downloadable worksheet and coloring a photograph of Rouen Cathedral. Are these paintings of the same building? How are they similar and different? Color is what we see because of reflected light. Light contains different wavelengths of energy that our eyes and brain "see" as different colors. When light hits an object, we see the colored light that reflects off the object. Red, blue, and yellow are the primary colors. With paints of just these three colors, artists can mix them to create all the other colors. When artists mix pigments of the primary colors, they make secondary colors. Did you know that your computer screen also works by using three primary colors? But here, since the colors are light from the monitor and not paints, the three primaries are not the same. Instead, your computer screen mixes other colors from red, blue, and green. One important thing painters know: using complementary colors—the ones across from each other on the color wheel (red-green, blue-orange, and yellow-purple)—make both colors seem brighter and more intense. They seem to vibrate and pop out at you, the viewer. Warm colors—reds, yellows, oranges, and red-violets—are those of fire and the sun. They appear to project. Cool colors—blues, blue-greens, and blue-violets—are those of ice and the ocean. They appear to recede. To get students thinking about color and the moods or feelings that colors can convey, read a book that focuses on color, such as The Day the Crayons Quit by Drew Daywalt. 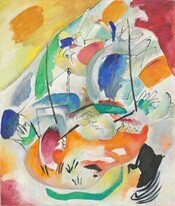 Then view the slideshow below to introduce students to three artists—Claude Monet, Henri Matisse, and Wassily Kandinsky—and the way they used color in their paintings. Each painting uses Rouen Cathedral to record time (morning or late afternoon) and weather (sunlight or mist). Examine the way Monet used color and texture: Can you tell from the shadows in the doorways which painting might have been done in the morning and which in the afternoon? (Don't forget that the sun rises in the east and these paintings show the west façade or front of the building.) How do the colors change in sunlight, fog, and mist? Would you rather go sailing or stay in your cool room admiring the view? How big do you think this painting is? It’s actually only 21 3/4 x 18 1/8 inches. 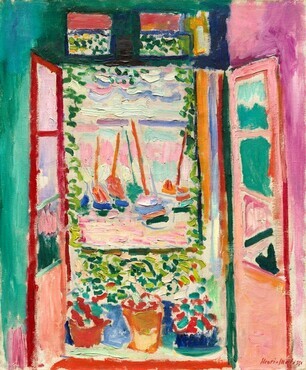 See how Matisse transformed the effect of a small canvas into expansive pictorial space through the device of the open window and eye-popping color. What colors do you see in this painting? What do the colors in this painting make you feel? happy? sad? scared? What do you think is happening in this painting? After students have hypothesized what the scene depicts, let them know the title contains the phrase “sea battle.” Now have them analyze the painting: Can you find two tall-masted ships locked in combat? Can they spot any canon fire? What is the sea like that day? The weather? Download a faded version of the photograph of the west façade of Rouen Cathedral in Paris that Monet painted at all time of day and in all types of weather (the original photograph is the first image in the slideshow). Students will select a time of day and type of weather and then color over this faded image using appropriate hues in oil pastel (preferable to cover image, but crayons could also be used). As an alternative that can accommodate students with visual impairments, print out a larger version of the images on 11 x 14 paper. Trace the lines of each image with hot glue to create a raised surface that students can feel. Then give students a plain piece of paper to lay over the image outlined in hot glue. Students can then create a texture rubbing with crayon over the paper. As a final step the students can paint over the crayon rubbing with watercolors. On a printed version of the image, trace the lines with hot glue to create a raised surface that students can feel. Give students a plain piece of paper to layer on top of the hot glue tracing to create a crayon rubbing. Paint over the crayon rubbing with watercolors. Now that students have investigated various uses of color in three artists’ works, they will fill out the “Colorful Language” worksheet to test their knowledge of color. Next, students will select one work of art from the slideshow as if it were a postcard of somewhere they visited. They will then write a short letter to a friend or family member describing what they saw, what time of day it was, and what the weather was like using the colors from the work of art as their guide. VA:Cr2.1.1 Explore uses of materials and tools to create works of art or design. VA:Cr2.2.1 Demonstrate safe and proper procedures for using materials, tools, and equipment while making art. VA:Cr3.1.1 Use art vocabulary to describe choices while creating art. VA:Re7.1.2 Perceive and describe aesthetic characteristics of one’s natural world and constructed environments. VA:Re7.2.1 Compare images that represent the same subject. VA:Re8.1.2 Interpret art by identifying the mood suggested by a work of art and describing relevant subject matter and characteristics of form. VA:Re9.1.2 Use learned art vocabulary to express preferences about artwork.